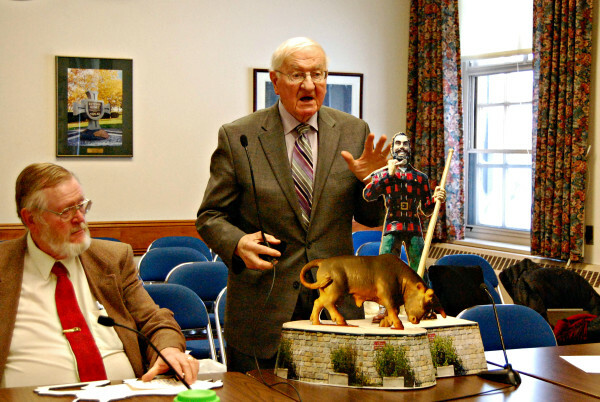 J. Normand Martin presents a mock-up showing how Bangor's Paul Bunyan would appear with the addition of Babe the Blue Ox. 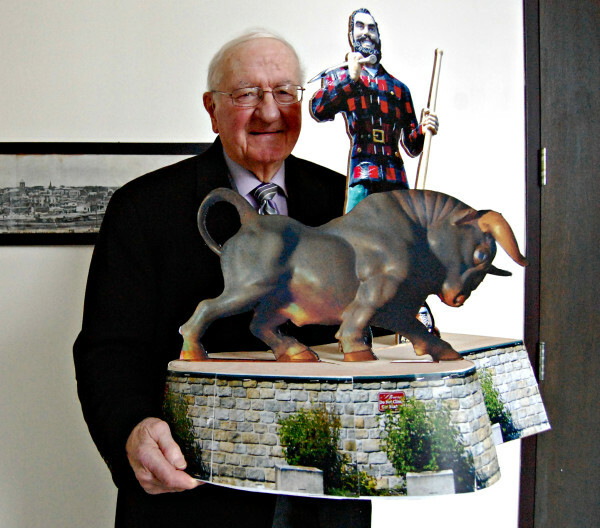 J. Normand Martin presents a mock-up showing how Bangor's Paul Bunyan would appear with the addition of Babe the Blue Ox. Seated to his right is former Bangor City Councilor Gerry Palmer. BANGOR, Maine — For 56 years, a 31-foot-tall statue of Paul Bunyan has gazed toward the Penobscot River. Now, the sculptor who designed one of Bangor’s most notable landmarks wants to add the giant lumberjack of American folklore’s trusty friend, Babe the Blue Ox, to the site. If constructed, Babe would measure approximately 20 feet in length, according to Martin. 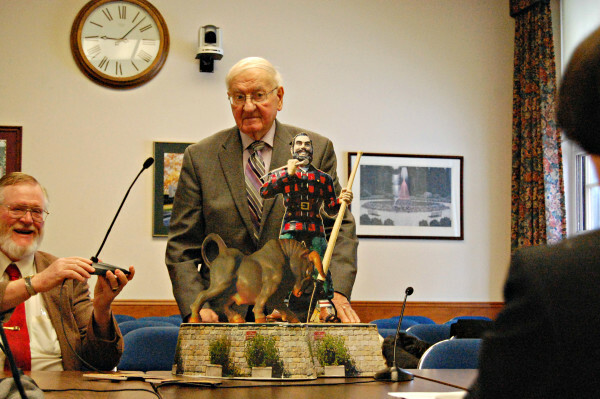 Working in conjunction with former city council member Gerry Palmer, Martin presented a mock-up of the Babe statue to the Commission on Cultural Development on Thursday. He gave the commission members two possible versions of oxen for the project. Palmer said they would seek a $1,000 grant from the commission for Martin to create a clay sculpture of Babe that could be used to construct a full-size statue. They have not completed cost estimates for creating the full-size Babe and do not have a timeline yet, Palmer said. “We have Mr. Martin, who is in his 80s now, and if we could just get the model, then if the money took more time … we would still have the model,” he said. Martin took two weeks to craft the clay model of Paul Bunyan that New York sculptors used to create the fiberglass statue that helped commemorate the city’s 125th anniversary in 1959. He said he became the sculptor by chance. Prominent Bangor resident Connie Bronson came up with the idea, he said, but there were few sculptors in the state of Maine. At the time, Martin was an artist and partner at Tom Cain Advertising in Hampden. When Cain, who was on the board planning the anniversary festivities, told him of the project, he decided to create the model. “So I did, and the committee liked it and we were off and running,” Martin said. Palmer told the commission that adding Babe would highlight the city’s agricultural heritage in addition to its logging tradition. He showed them a birth certificate that hangs in the city clerk’s office. Issued in 1959, it records Bunyan’s birth in Bangor on Feb. 12, 1834, to parents Jaques Bunyan and Sarah Marie DuBois. Whether Paul Bunyan folklore originates in Maine is still debatable, he admits, with at least 16 other statues of the lumberjack scattered across the nation. As for Babe, legend has it that Paul Bunyan found a baby ox while out walking in the woods one cold winter day, according to the website Americanfolklore.net. The snow was blue that year, and the ox was stained permanently by it. Bunyan raised the animal, which he named Babe the Blue Ox, and it grew to enormous size, helping the lumberjack create logging roads as well as haul logs. According to Martin, the Paul Bunyan statue cost $20,000 to build in 1959. “Don’t expect it again,” he told the commission. Adjusted for inflation, that’s approximately $162,705, according to the Consumer Price Index. Palmer said they hope to get money through charitable donations and sponsors, but he does not expect to ask for tax money to pay for the statue. Commission Chairwoman Jamie Ballinger said she looks forward to reviewing the pair’s grant application. The commission recommends artists and organizations for grants awarded by the city council. Ballinger said their allocation for grants this year is $10,000. Martin said the original sculpture of Paul Bunyan he created no longer exists, dropped by an artist during production of the full-size statue in New York. He also said he is not sure what he’ll do about the ox’s male genitalia, which is visible on the mock-up. “I don’t know. I’m looking for a little guidance,” he said. Palmer said they’ll be returning their grant application to the commission shortly. Earlier this year, the commission and City Council approved a $1,000 grant for a floating sculpture in the Kenduskeag Stream scheduled to be installed this summer.